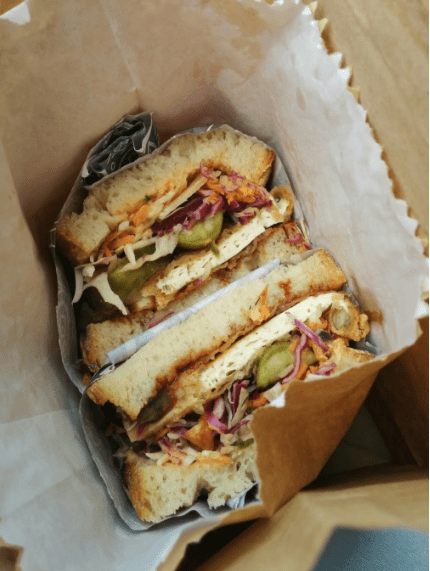 Last month we showed you the vegan highlights of Manchester. 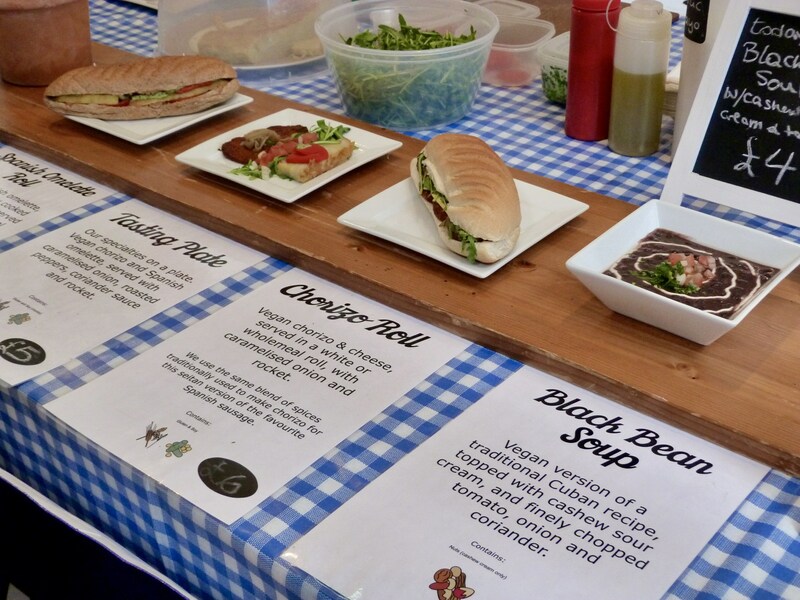 Now we’re turning our attention to England’s capital city, famous for Holmes, Dickens and…vegan burgers, apparently! MoFo regulars Jojo from Vegan In Brighton and Jenny from Jenny Marie provided us with these brilliant posts about some of their recent vegan finds in the Brick Lane area of London. You can check out there full posts here and here, but let’s see some of their highlights! 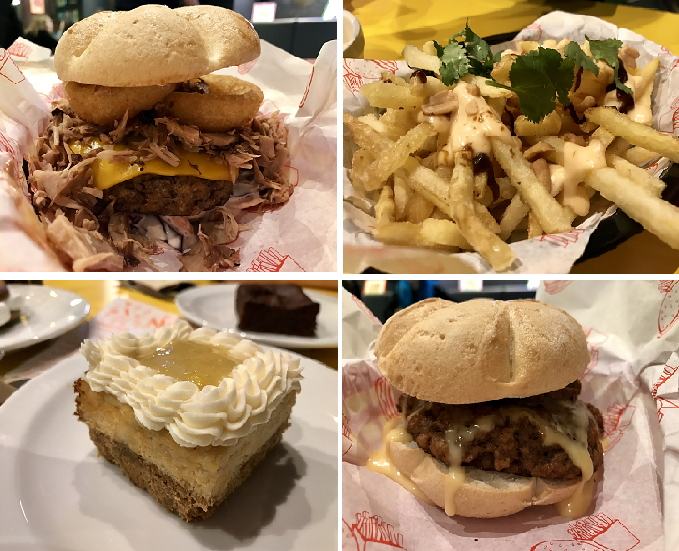 Mooshies is the first of two burger joints that both of these bloggers rave about, and it’s not hard to see why! 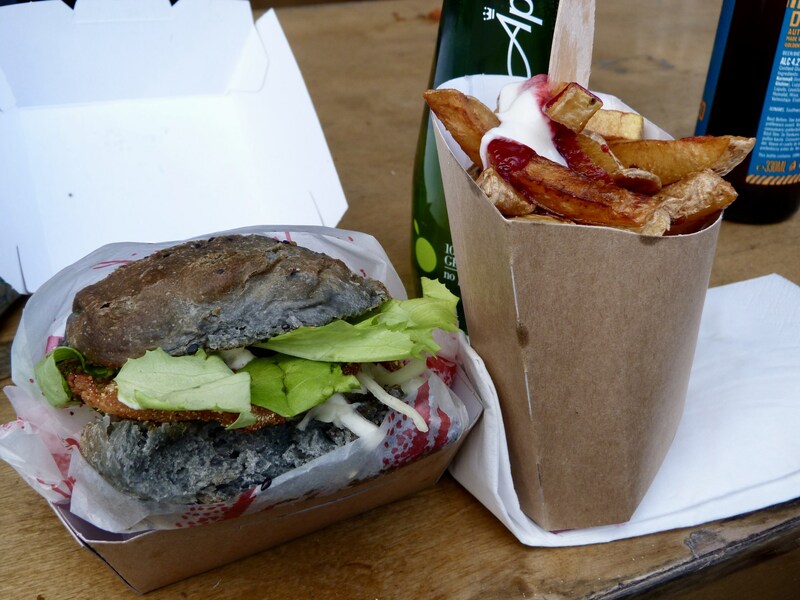 We’re talking fish burgers, jackfruit, bhajis…very tempting indeed. Here’s Jojo’s pulled jackfruit burger. …or this vegan chorizo roll that Jenny found. 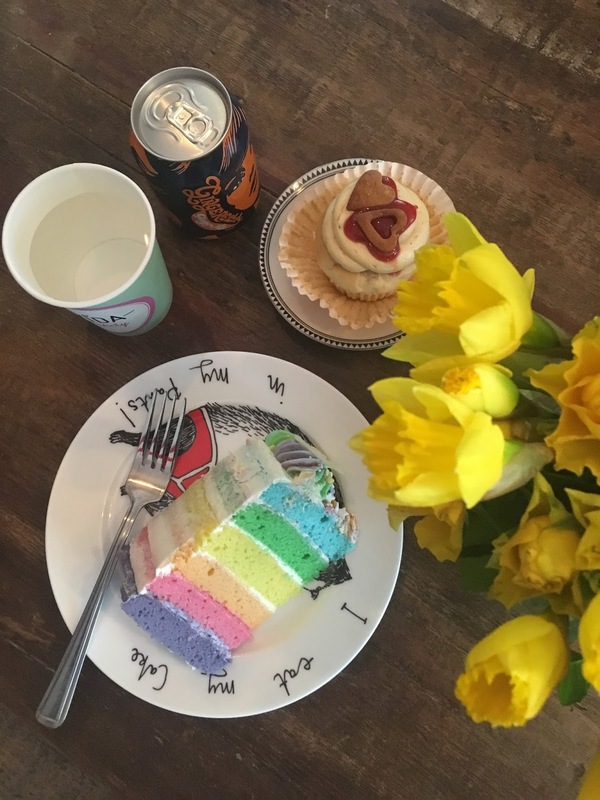 And if you’re looking for something colourful and sweet, follow Jojo’s lead and look no further than Vida Bakery, home of this delicious looking rainbow cake. 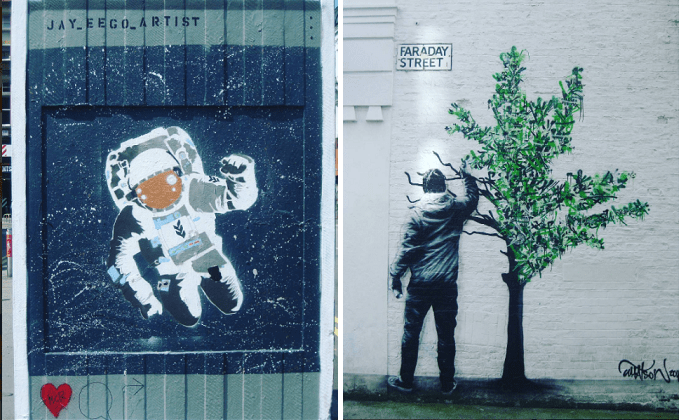 Clearly Brick Lane is a great area for vegan visitors to London, but it’s not the only one! 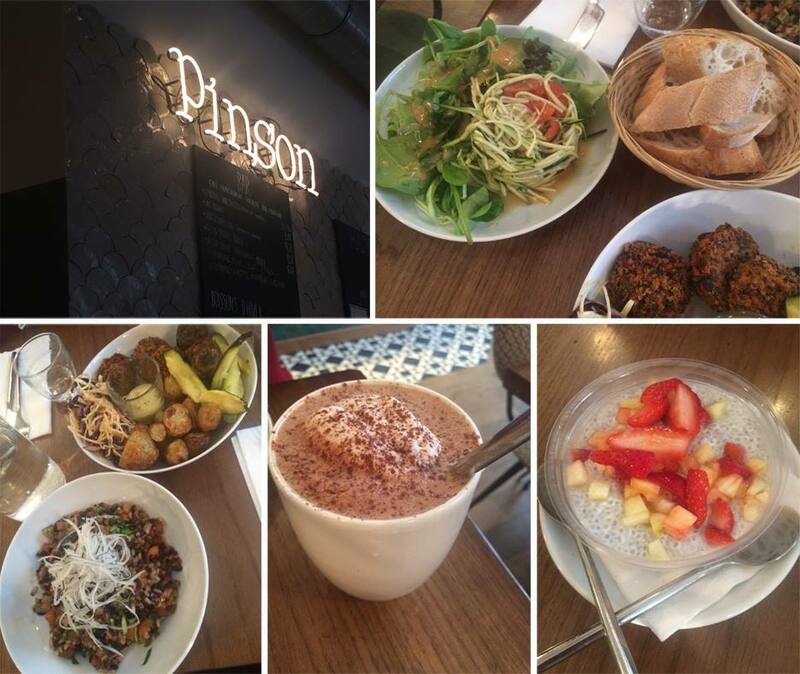 Over at Vegan London you can search by area for all the plant-based options in the city. And The Whole Ingredient‘s free, downloadable PDF guide to London, organised by meals (breakfast, brunch, dinner, etc). 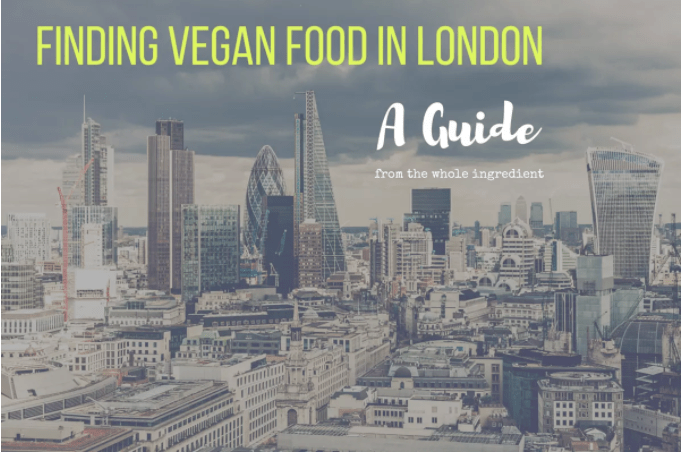 Including sections on pizza delivery places, vegan grocery stores, vegan markets and so much more, the guide is invaluable for anyone looking to eat vegan in London! What are your favourite spots in London? Any ideas for our next VeganIn destination? Let us know! 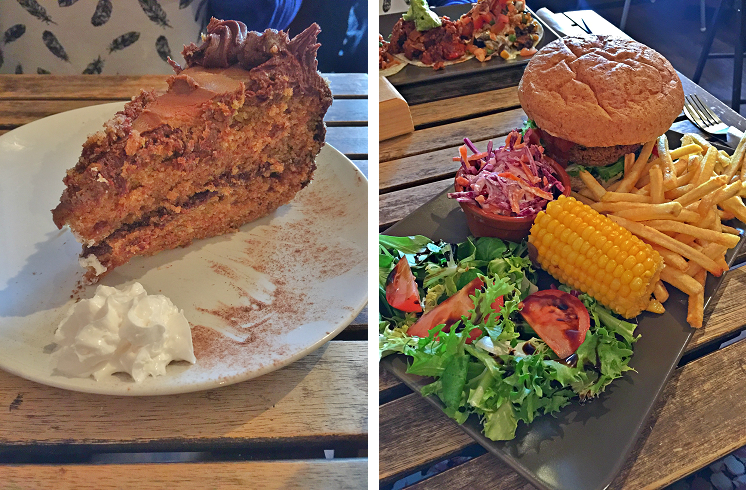 Manchester may not be the biggest city in the UK, but it’s definitely one of the best when it comes to vegan grub! 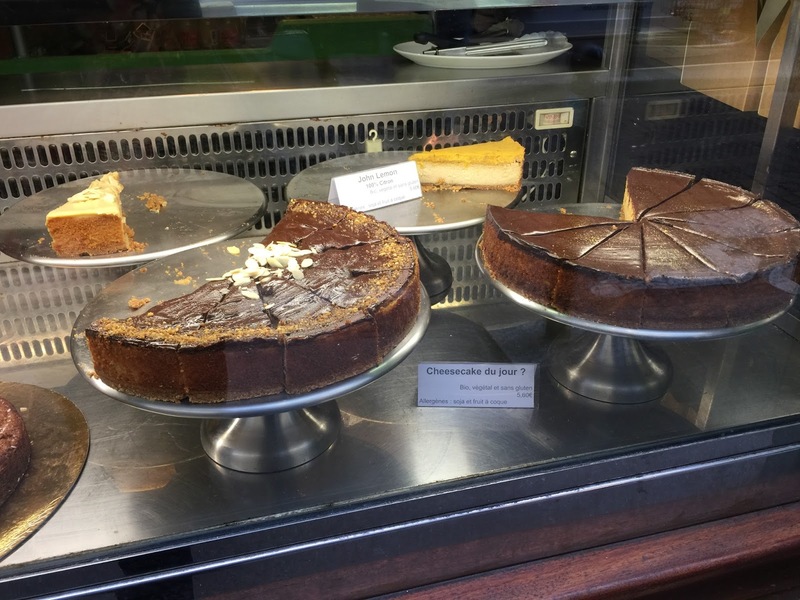 Alongside a wealth of chain restaurants in the city centre with vegan options or even separate menus, there are some great independent cafes and restaurants you should know about. Here’s a little taster of some of the top spots in this great city – including the Best Vegan Restaurant in the UK (according to the 2016 VegFest awards). 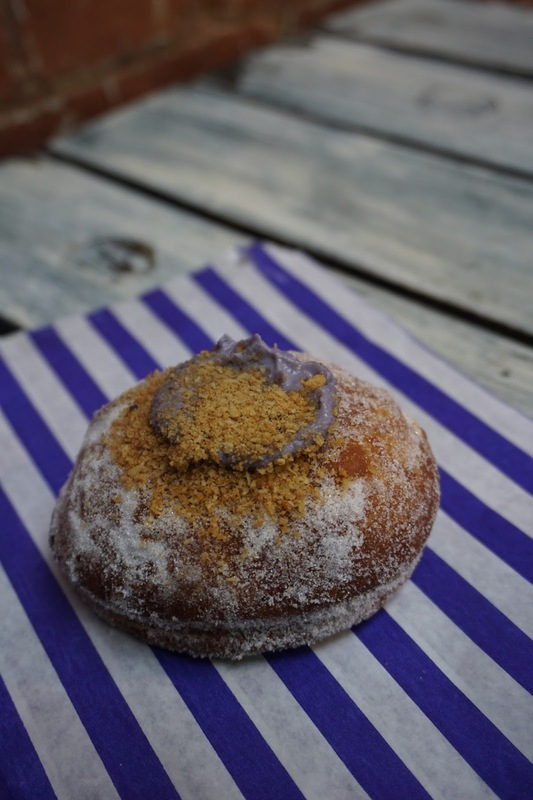 That honour goes to V Rev, a vegan junk food extravaganza. MoFo regular Jenny (formerly of Spice Box of Earth, now Jenny Marie) reviewed it as soon as it reopened in new premises late last year. Don’t those burgers look incredible? This place is just as famous for its dessert as for the gigantic burgers. There is no shortage of cheap and cheerful little places offering rice’n’three, including This’n’That Cafe. One such place, Little Aladdin, recently went all vegan too! 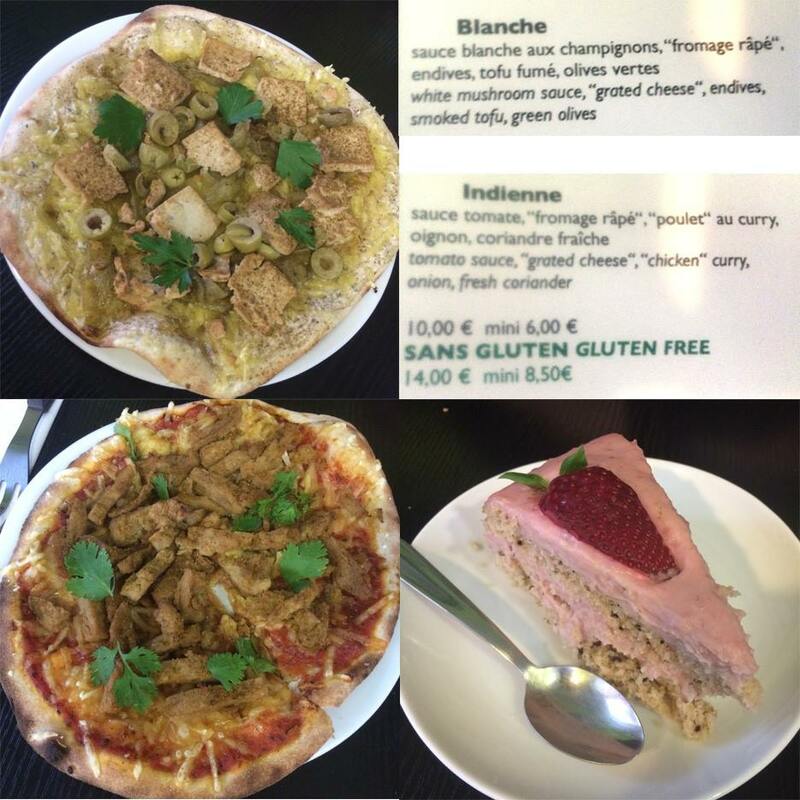 Restaurant reviewer Vegan Olive is another great resource for vegans visiting Manchester. You can check out her reviews here, including for this slap-up breakfast at Trof (also in the Northern Quarter). 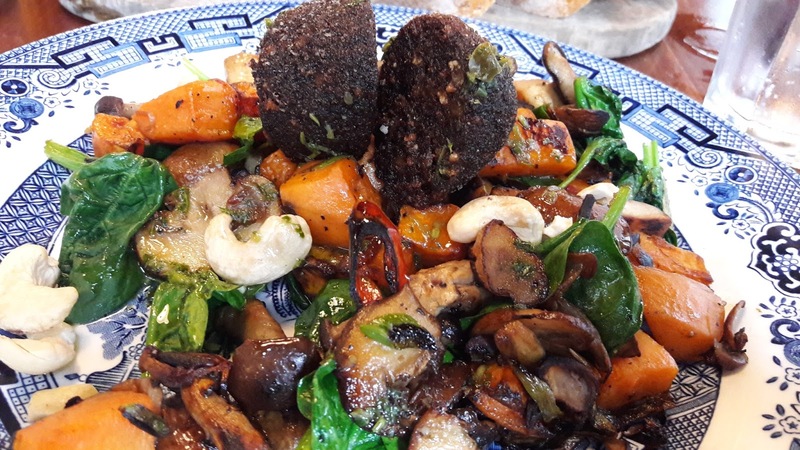 If you’ve ever wanted to try vegan black pudding, here’s your chance! Olive also has a review of The Pasta Factory, famous for its excellent ravioli, all-vegan alcohol menu and homemade parmesan. Yum! 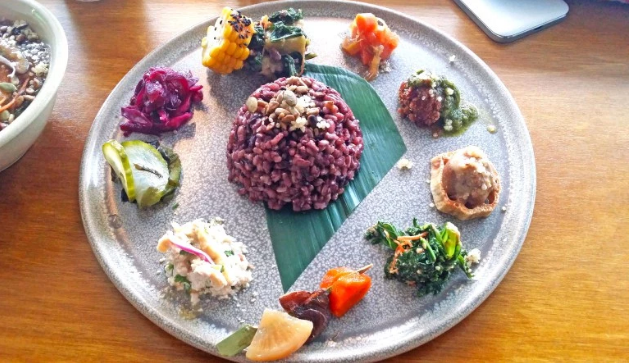 Venturing further afield from the Northern Quarter, here’s a newcomer to the scene: 100%-vegan fine dining restaurant The Allotment. 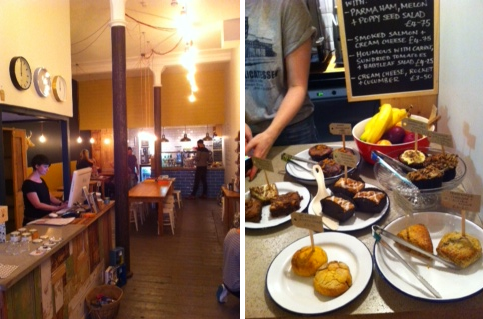 There are more Manchester reviews to be found here on Herbivores’ Heaven. 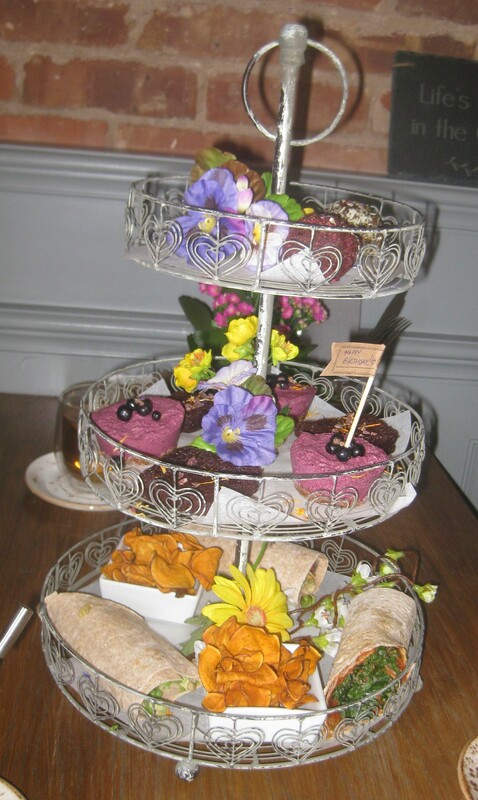 You can also find the quintessential British experience in Manchester, with numerous places offering a vegan afternoon tea. This one at The Garden is a particular favourite – it’s so flavoursome, you won’t even mind the lack of scones! So whether you want a big breakfast, delicious cake, fast food or fine dining, Manchester has you covered! 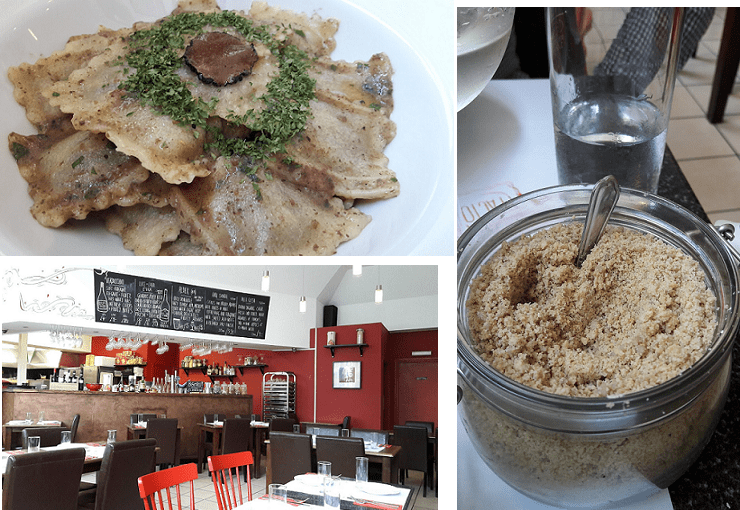 Whether you love veganism, love food, or love love – we have got some French classics and some Paris recommendations for you in this month’s installment of VeganIn. 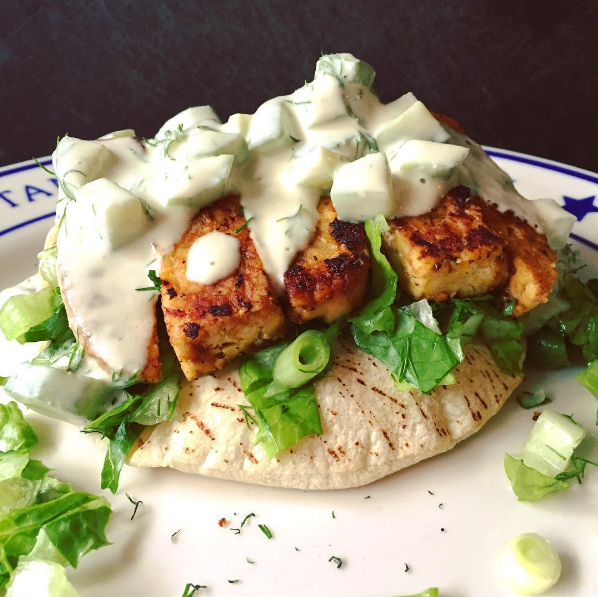 Read about Cafe Ginger, Brasserie Lola, Hank Vegan Burger, and Vegan Follies. 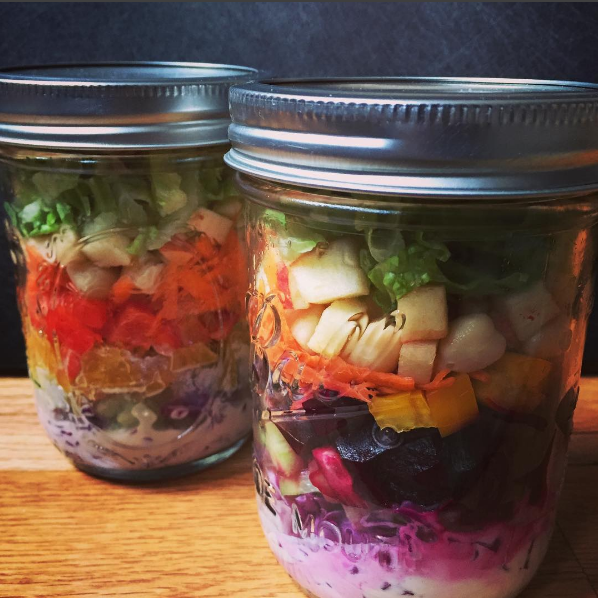 Go give her all the compliments @herb.cuisine so she shares her recipe! 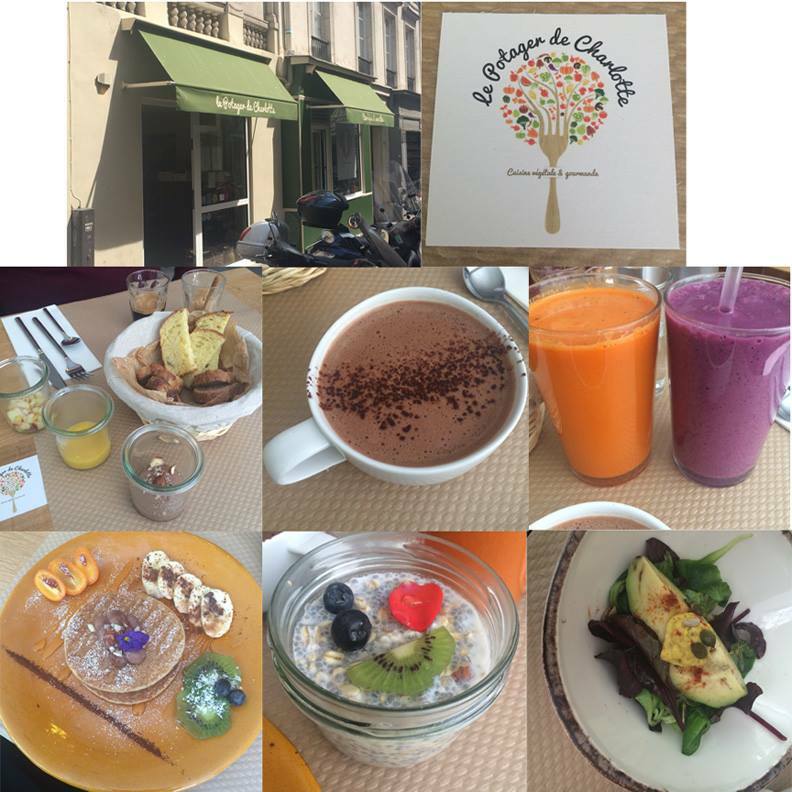 The lovely Jenny over at Spice Box of Earth was in Paris back in 2015 and ate all the good food! 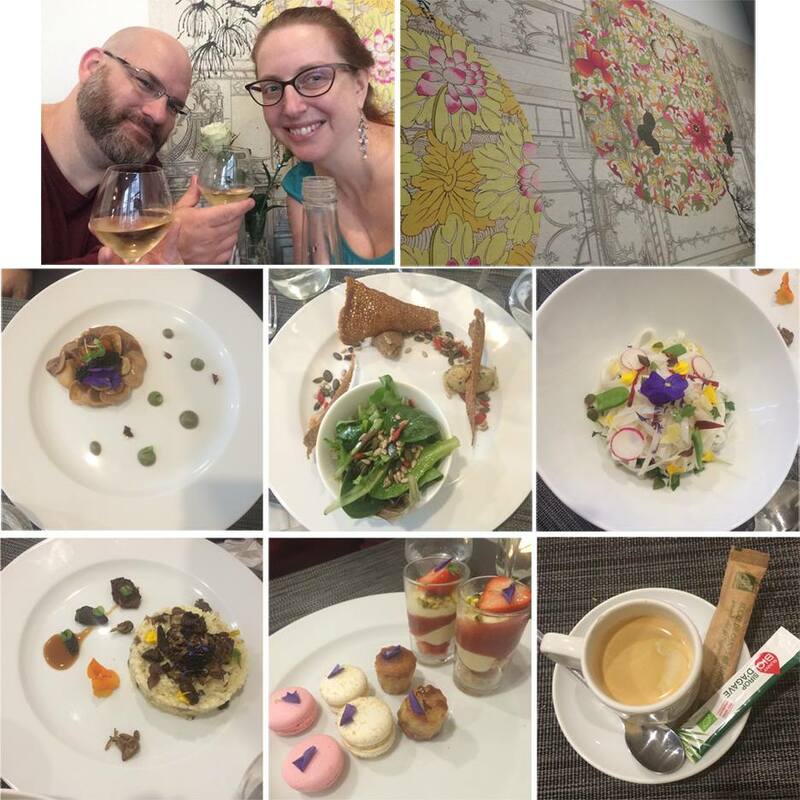 Read all her Paris travel trips, and find out about Le Potager du Marais, Cafe Ginger, Un Monde Vegan, Hank Vegan Burger, Las Vegans and Vegan Folie’s. Doesn’t her photo of these delicious cakes make you want to book a flight to Paris right now?! 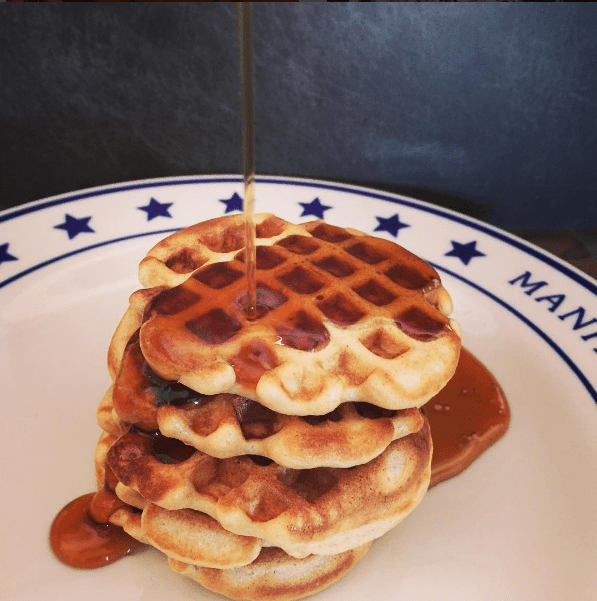 A lot of the same restaurants are reviewed over at Herbivores’ Heaven, along with Brasserie Lola, Gentle Gourmet and a pet cemetery, for all the animal lovers! Vegan croque monsieur? Yes please! MoFo regular Jojo over at Vegan In Brighton has a number of Paris-related posts, the most recent from a weekend trip last year. 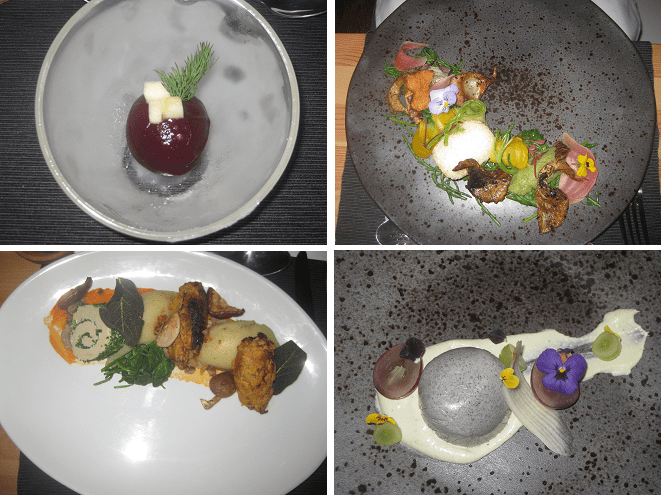 Check out her thoughts on Brasserie 2eme Art, Ara Chocolat and Cloud Cakes, amongst others. 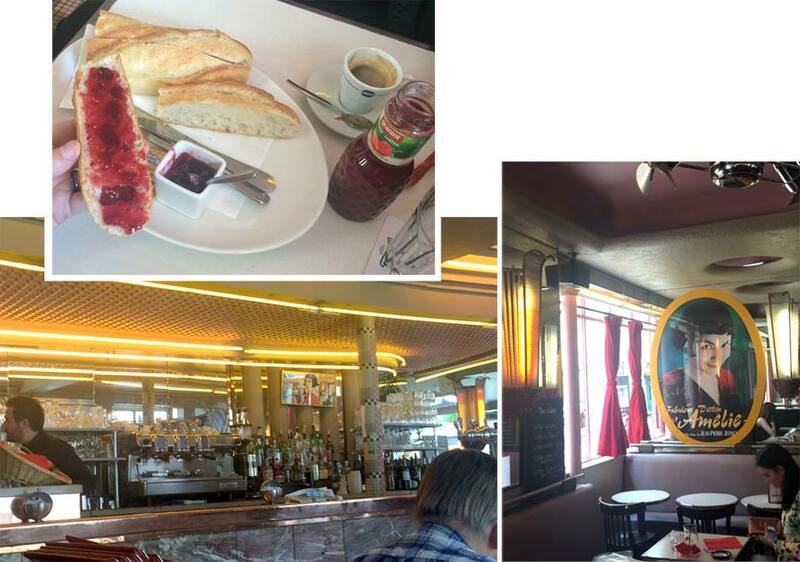 I really wanted to check this place out on my honeymoon to Paris – I mean, it’s Amélie’s cafe! Unfortunately, they don’t have much for vegans, and the waiter seemed a bit exasperated with me when I tried to hand him my “I’m vegan and I don’t eat these things” card. My husband and I ended up with a baguette, some jam, fruit juice, and espresso. It was still tasty, for all that it was simple. It was also our first foray into the world of Paris coffee – a few places have non-dairy milk (especially the 100% vegan restaurants), but nobody orders cafe mochas here. You get espresso. Everywhere that serves it generally gives it to you with a packet of sweetener (raw sugar and/or agave nectar at the fancy places, plain sugar elsewhere) and some kind of sweet (usually a small square of chocolate or a cookie, which was often a vegan Speculoos!) As for the cafe, it’s adorable and they know it – there’s a few pictures of Amélie throughout, but don’t expect to see the clear board where she writes the menu backwards; it’s not there. My husband and I decided to go to Le Potager de Charlotte for weekend brunch. If you decide to do the same, COME HUNGRY. I can not stress this enough. There’s a ton of food, and it’s all delicious. We started with several types of fresh bread and a few different spreads, all made in-house. I also got fresh juice and hot chocolate, pancakes with fruit, a breakfast chia oat pudding, and an avocado spinach salad. It’s a good thing we were walking so much while in Paris! Cozy, comfy, and quick – that’s Hank Vegan Burger. 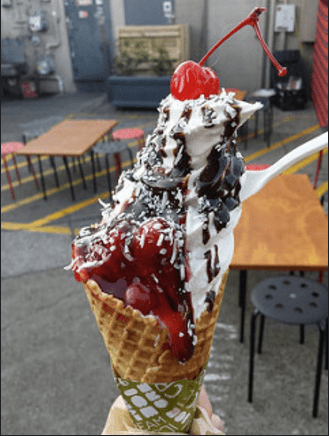 They have a bunch of inventive topping combinations for their burgers, as well as sides, drinks, and desserts. The majority of the dining area is upstairs from where you order. We loved our burgers, fries, cookie, and cake! We ended up at Cafe Ginger after an attempt to go to a vegan restaurant down the street that wasn’t open. It’s a tiny macrobiotic cafe inside Grand Appetit, which is a macrobiotic and natural foods store. When you go, pay attention to their hours – we got there towards the very end of their open times, and they had pretty much stopped serving their main menu, and we were left with ordering something out of the case. 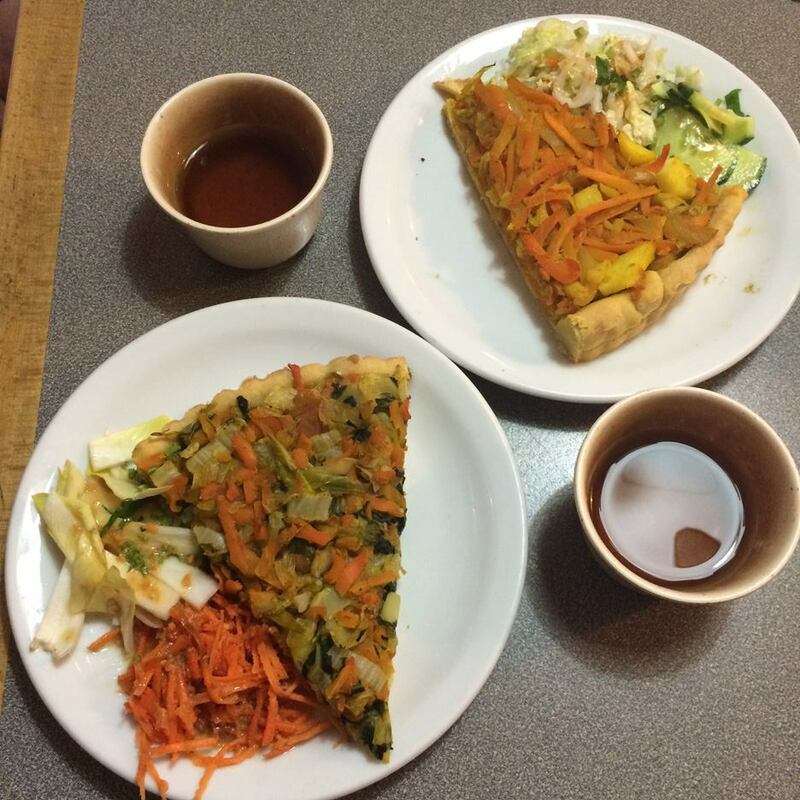 That being said, we ended up with a couple slices of delicious vegetable tart, side veggie salads, and hot tea. Lucky for us, there was a customer in the restaurant who was happy to explain to us what the owner was telling us (the owner had no English, and my French wasn’t quite up to the task). Interestingly, the customer turned out to be an employee of the restaurant down the street to which we had originally tried to go! The ordering system at Cafe Pinson was a bit confusing to us, and we ended up sort of pointing at things in the case while the gal behind the counter tried to explain what we could get. For one price, you get an entree and main dish, or main dish and dessert. They also have fresh juices and coffee. Luckily, the gal behind the counter had enough English to catch that we were vegan, and was able to point out which things were vegan and which were just vegetarian. The salads and main dishes were fresh and healthy, and I was happy to get hot cocoa with vegan whipped cream on top. Vegan Folie’s is mainly a bakery with punny names for their sweets (the James Brownie, Rosa Pinks, Red Astaire, and Choc Norris, for example). They also have giant sandwiches, which are probably enough for most people to split (though my husband wanted a whole sandwich to himself – again, I was glad for all of the walking we did!). This was, by far, the fanciest restaurant that we went to the entire time we were in France. Also, the priciest, but for a splurge, it’s a great choice. Gentle Gourmet goes for quality over quantity, and their plating is exquisite. We experienced all sorts of complex flavors and textures. For dessert, we got the sampler plate, which was the first time in my life I’ve ever eaten French macarons! These were made with aquafaba and were little bites of absolute heaven. Reservations are very important here – if you don’t have one, you might not be able to eat there that day. We weren’t quite sure what to expect from this restaurant, and found a sort of buffet set-up. We spent some time foraging amongst the offerings, and came out with all sorts of fresh veggie dishes, as well as tasty savory and sweet tarts. The ambience is spare and modern (makes me think of IKEA a bit). 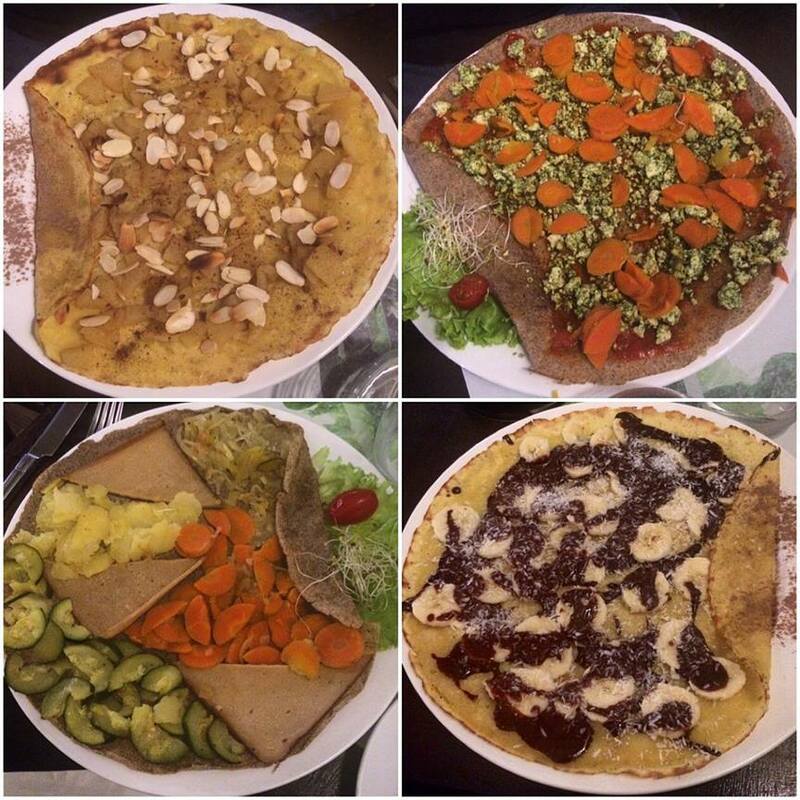 Seriously, y’all – vegan crepes! My husband and I each got one savory crepe (galette) and one sweet crepe. They were delicious, and we also got hot cocoa with non-dairy milk to go with. Not a restaurant; this is Paris’ only 100% vegan grocery store. They had *two whole cases* of vegan cheese, which was quite exciting. My husband and I stocked up on vegan cheeses, “meat” sticks, drinks, and chocolate to snack on at our apartment and on the train to Angers. We also got a vegan paté that was quite tasty! This restaurant is larger than some of the others we visited in Paris, but not by a lot, and diners will be seated in fairly close quarters with others. Also, reservations are important here. This was one of the fancier places we went, and the flavors in the dishes were interesting and fun. This was another place where I got super-fancy vegan hot cocoa (yay!) and delicious pudding. We ate at Loving Hut a couple of times. It was economical and close to the metro stop. Their food was better than the Loving Huts I have been to in the US. The appetizers were all so good. 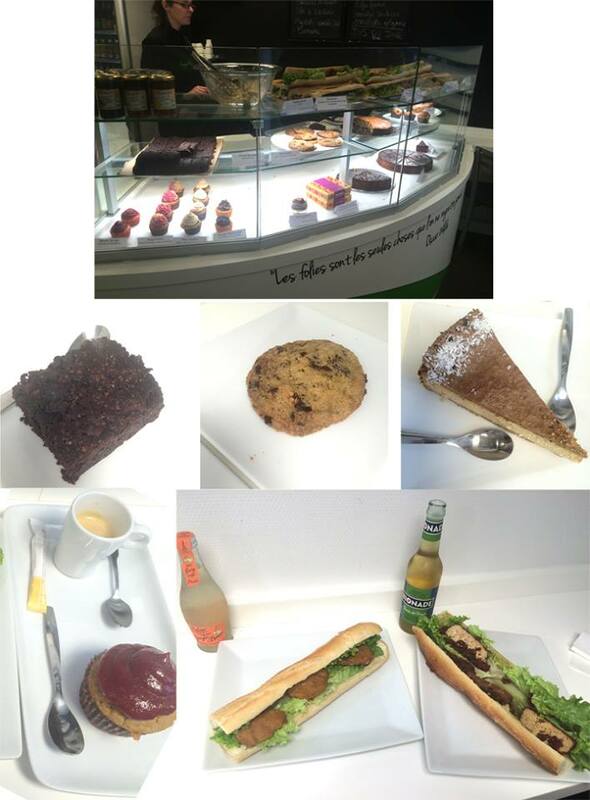 We also liked Veget’Halles, a vegan/vegetarian restaurant near Le Centre Pompidou with a lot of options. Are there any places we’ve missed? Have we motivated you to book a trip to the city of love and vegan macarons? Let us know, and stay tuned for the announcement of next month’s VeganIn destination! 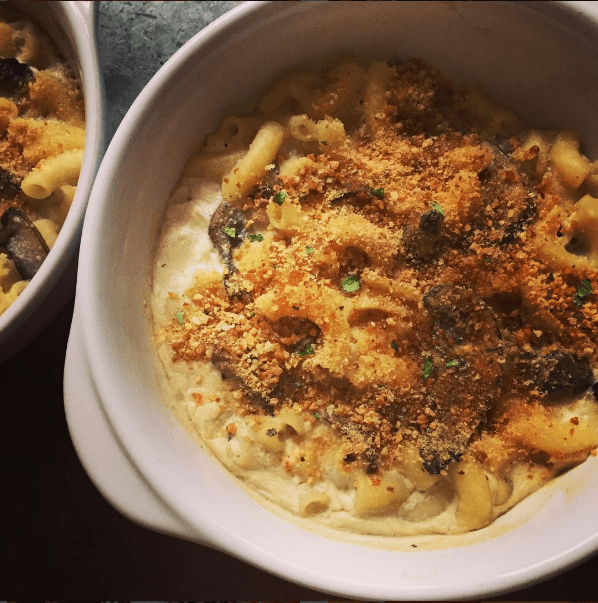 This month we’re shining the spotlight on Lisa’s Project: Vegan, a wonderful blog full of Lisa’s simple yet delicious recipes. 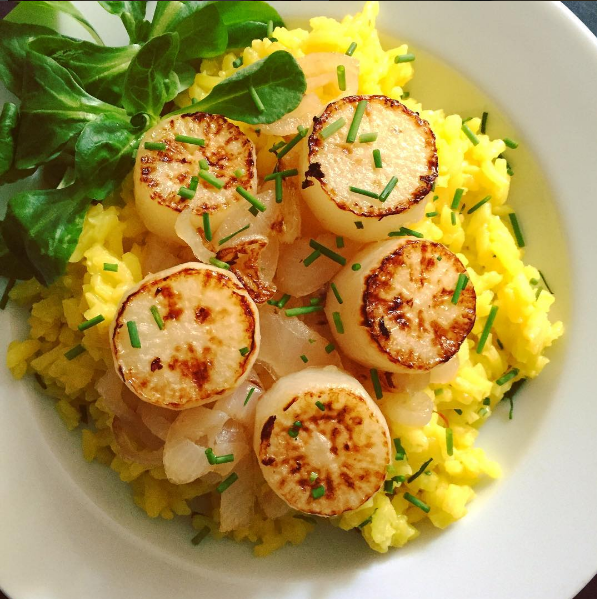 You can also lust over all her food on Instagram: it won’t be long before you’re clicking through to her recipes! As a bonus, most of her recipes take just 30 minutes to make, so you’ll never be slaving away. Lisa was kind enough to answer a few questions and help us get to know her a bit more. I have been vegan for over a decade. I started my blog 6 years ago. When my son was a baby, and took long naps, I would be I the kitchen experimenting. I didn’t have a repertoire back then and was kind of amazed when I made cream sauce out of cashews. I posted my lunch on Facebook because I was so impressed with myself! An old friend from high school asked for my recipe and if I had a blog. I didn’t even know what a blog was but once I figured out that I could post and record my recipes online, I created Lisa’s Project: Vegan. What’s the best feedback you’ve had on one of your recipes or dishes? I have gotten a lot of great feedback over the years but mostly that my recipes work, are easy, and inspiring. I always remind people that cooking is an art and often people tell me that they added this or that to one of my recipes and came up with something they love. Nothing makes me happier. Where do you get your recipe inspiration from? I am inspired by my family and what we like to eat. If we go out to a restaurant and we love the menu, I will figure out how to make a dish at home. If we see a recipe in a magazine, a cookbook or a cooking show, I will adapt it to work for us in terms of flavor profile, portion size and technique. Are there any other vegan blogs you love? There are so many great blogs out there now but I will always have a special place in my heart for the old PPK (Post Punk Kitchen). What’s your favourite cookbook and cuisine? Right now I am obsessed with Salud Vegan Mexican by Eddie Garza. It is so different than a lot of the new vegan cookbooks that have been coming out lately. Mexican has always been one of my favorite cuisines and this book takes it a whole new level for me. It is going to be a cooking challenge the likes of which my kitchen has not seen since my early vegan cooking days. I have already made churros (my son thinks I am a genius) and cauliflower palm heart ceviche. I will be posting a book report and these recipes on my blog soon! Which holiday do you most love cooking for? I love cooking for Thanksgiving. It was a big deal when I was growing up when my entire extended family descended on my house and my mother went all out. That tradition continues today when everyone comes to my house and I get to feed my family with healthy, vegan versions of old traditional foods and, of course, some new ones too. Do you have any plans to create a recipe book/ebook in the future (or a different cooking/blogging ambition)? Yes, in fact, I am working on a book about how to cook vegan. I want to teach people the basics of vegan cooking – from tofu and tempeh to beans and grains – and how to plan, shop and create custom recipes and meals that they, and their families, will love. What is the one recipe of yours that we should all check out? 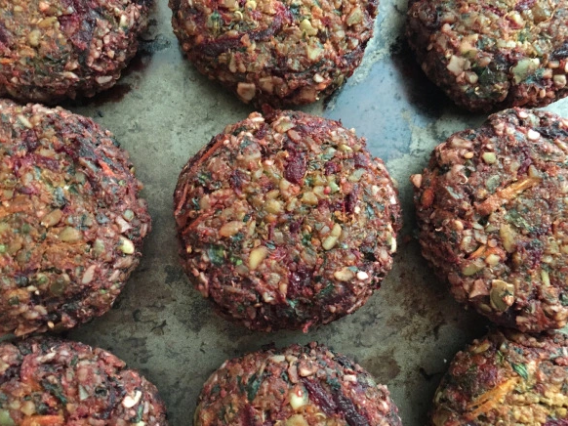 Try my tempeh meatballs and beet burgers. 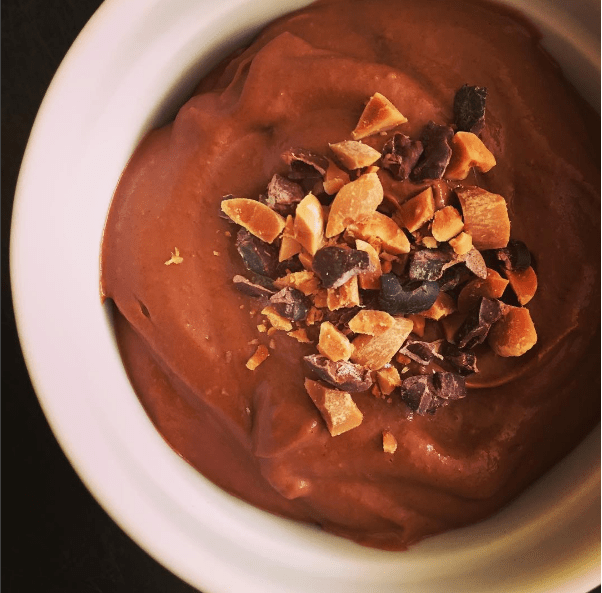 So if you’re stuck in a rut of the same old recipes all the time, head over to Lisa’s Project: Vegan for something healthy and delicious! Who would you like to see featured next? Leave us a comment and we’ll check them out! Interested in being featured as our Blogger or Social Media Mofoer of the month? The best way to get noticed is to participate in our monthly #minimofo challenges and VeganIn features, as well as the veganmofo main event! One of our new VeganMoFo initiatives is to showcase some of the great vegan destinations around the world. We have participants in VeganMoFo from all around the world which gives us a wonderful opportunity to find out what it’s like to be vegan in all different places. This month, we’re kicking off with a whole country: Australia! And Susan is not our only Vegan MoFo’er from Australia. 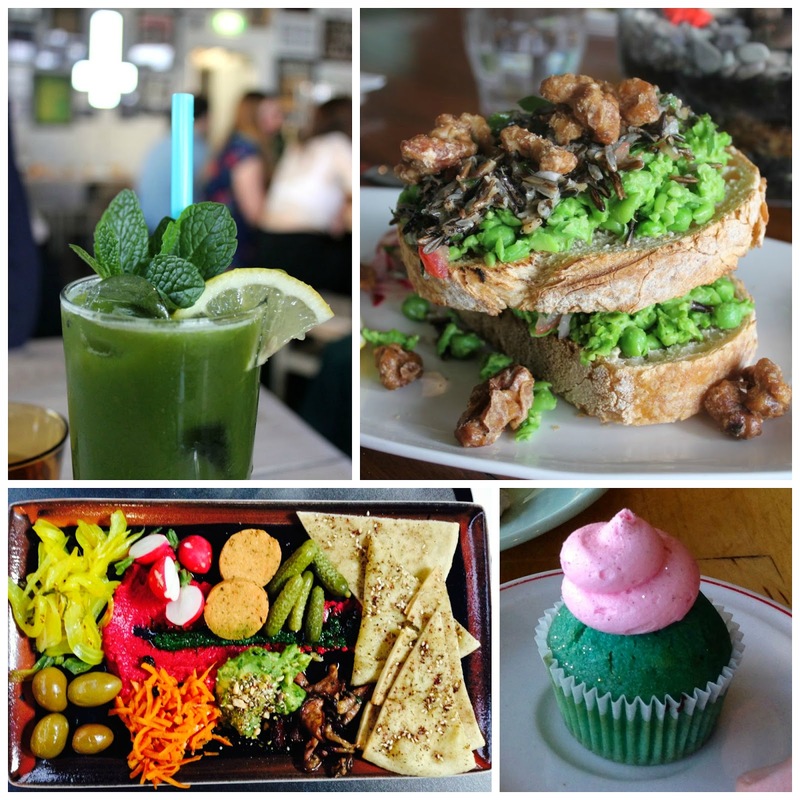 Head over to Little Vegan Bear for a huge variety of beautifully photographed restaurant reviews (both in Australia and New Zealand) and travel guides. 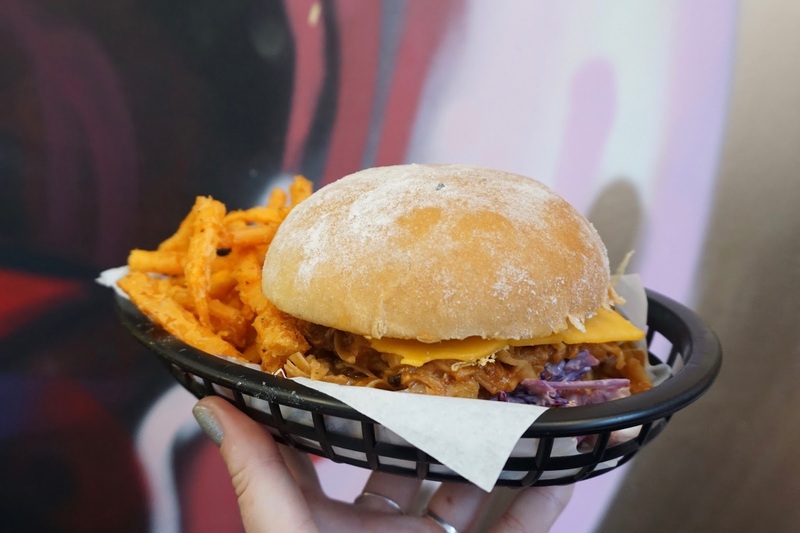 Faye from Veganopolous is a Melbourne-based blogger who has a large list of reviews and posts about the vegan scene there – split into districts for ease of reading! Five time VeganMoFo-er Johanna at Green Gourmet Giraffe is also Melbourne based and has written a guide to eating vegan there too. 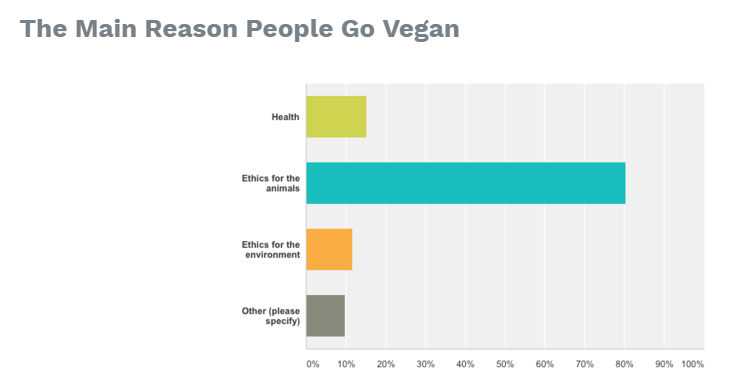 If you’re interested in the vegan scene in Australia, check out the findings of this survey of 726 Australian vegans conducted by Hesham Mahdi. Amongst other things, you can find out their reasons for going vegan and any books or documentaries that were contributing factors. Hesham’s website, Vomad, also has a free downloadable vegan product guide to Australia for those interested in finding out more. One of the main aims of Vegan MoFo is to give you all the chance to expand your vegan network and discover new plant-based blogs and social media accounts. This year we’re going to bring you a blog and social media account of the month to help you find some of the most active and inspiring vegan feeds out there. 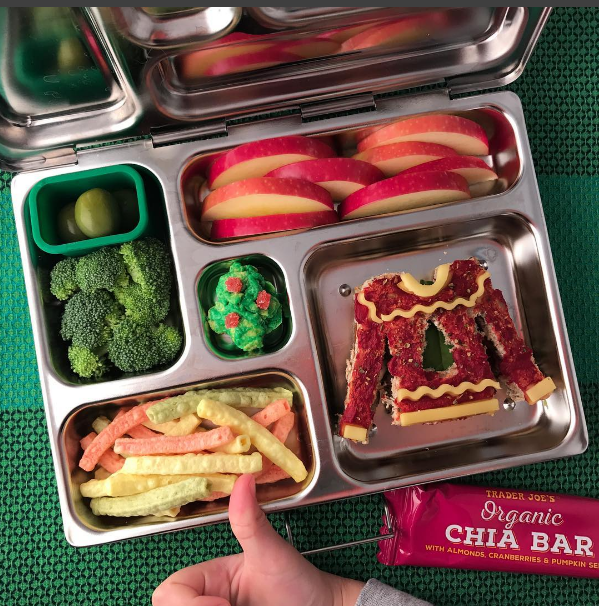 We’re starting with Instagrammer Happy Little Lunch, who posts almost daily photos of the packed lunches she makes for her vegan kindergartener. As soon as you see them you’ll wish that she were packing you off with your lunch as well! 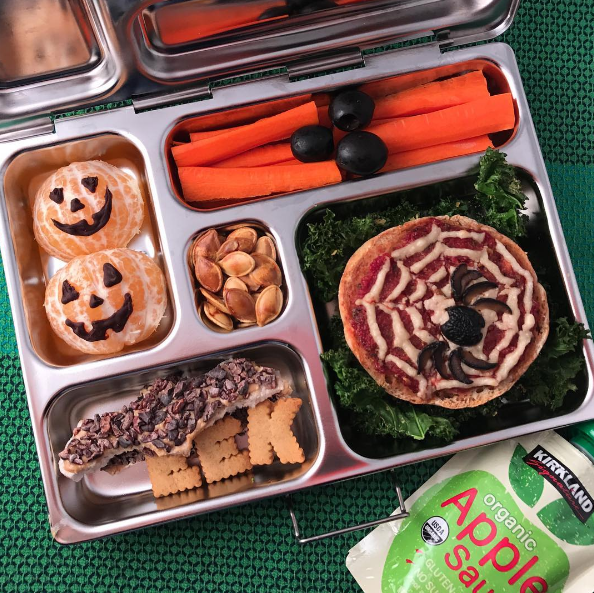 We’ve seen themed lunchboxes for Halloween and Christmas, as well as some great tie-ins with the VeganMoFo prompts. We chatted with Honora, the woman behind the account, to find out where she gets her inspiration and what the kindergarten crowd thinks of these little boxes of goodies! What inspired you to get onto Instagram? 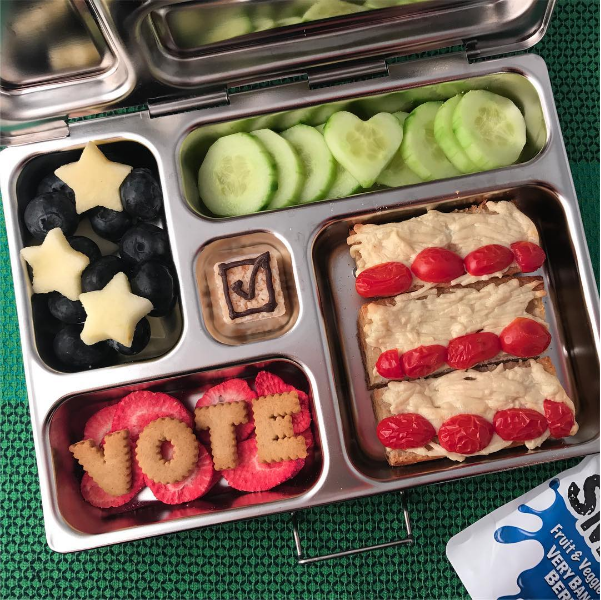 My older daughter was about to start kindergarten and I knew I’d be packing her lunch every day, which felt a little intimidating – I’d packed a lot of lunches in my day, but always for adults. A few days before school started, I decided on a whim to start this account to (a)keep myself accountable as far as the variety and quality of her food goes, and (b)not overwhelm my personal IG with food pics. 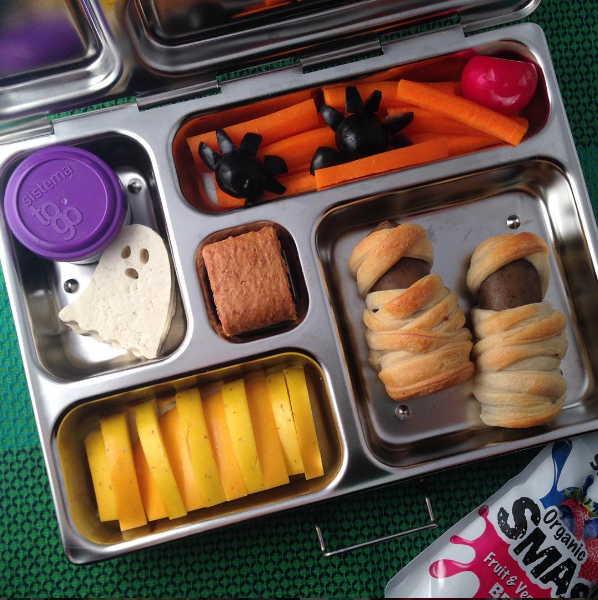 What’s the best feedback you’ve had on your packed lunches? A couple of people have told me they look forward to packing lunches like mine for their future vegan kids – that makes me smile. And in real life, my daughter has gotten a lot of positive comments about her lunches from the staff and students at school – I like that we’re representing veganism well and I love that she feels proud of her food. Are there any other vegan social media accounts that you’re hooked on? So many! I really love @myzoetropeeats – Michelle’s photos are always so colourful and enticing and just make me happy. I also love seeing what @jayastafacateringandevents creates. 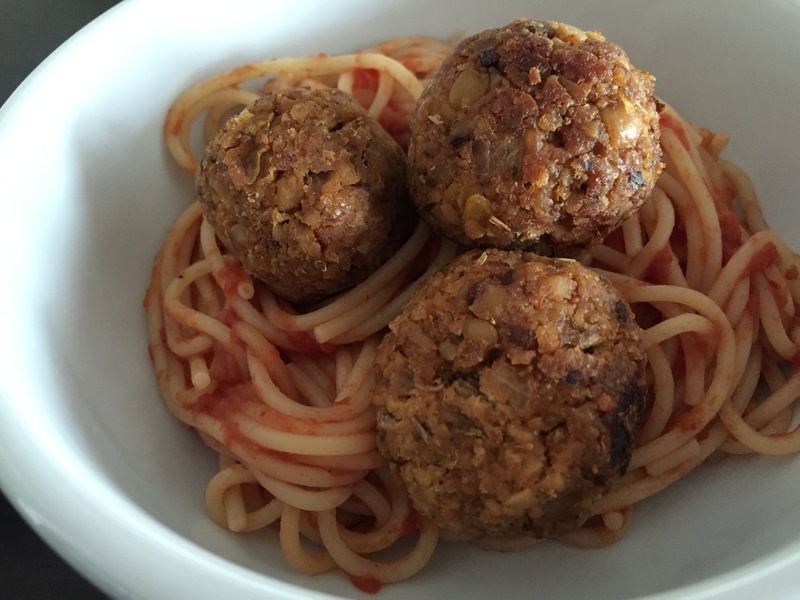 I remember him posting years ago – I believe when he was still a teenager – on the old PPK forum about adding vegan items to the menu at his family’s restaurant on Long Island. Seeing how far he’s come and his incredible creativity is really inspiring! 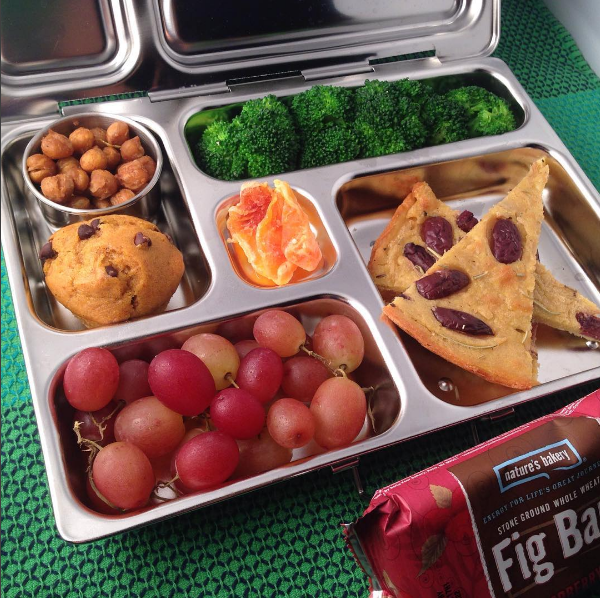 Where do you get your packed lunch inspiration from? Mostly from what’s in the fridge! 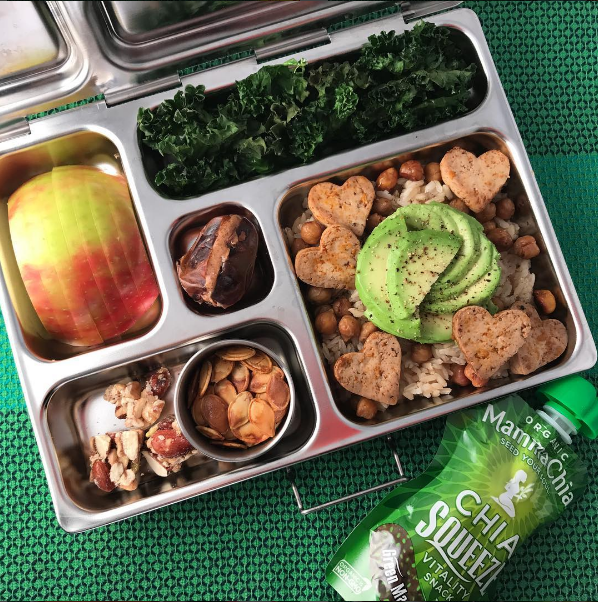 But the PlanetBox lunchbox I use has actually been really helpful for planning purposes – thinking of the different compartments as main/veg/fruit/etc makes packing a balanced lunch less daunting. Do you have any favourite cookbooks and cuisines? Isa [Chandra Moskowitz] and Terry [Hope Romero] are my forever faves. I also really like Chloe Coscarelli’s recipes and find them to be very kid-friendly. And I feel like Dreena Burton is the queen of vegan recipes created with kids in mind. As far as cuisines go, I’ll try anything! What do you cook when you’re not making packed lunches? Breakfast and dinner! Our evenings are busy and I make a lot of bowl-type meals and stir fries that come together quickly. I got an Instant Pot recently and have been having fun with that too. I love to bake but don’t have much of a sweet tooth, so I really look forward to fundraisers and events that allow me to make desserts for other people. 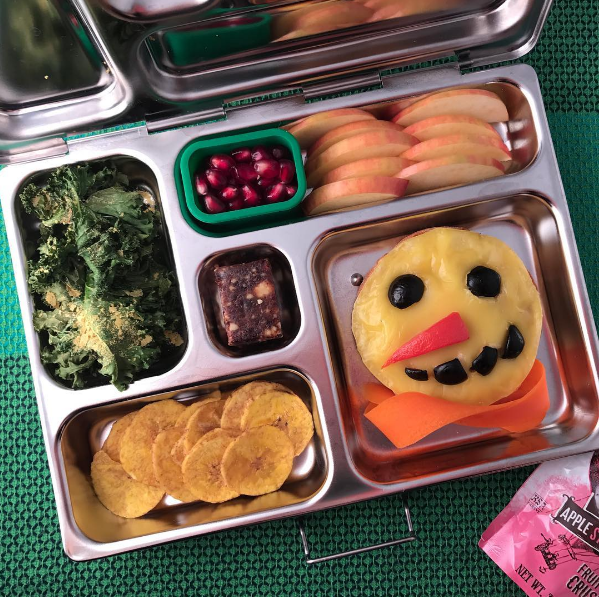 Make sure you check out @happylittlelunch yourself – this is an Instagram account that will revolutionise your approach to lunch, whether you’re preparing for a child, loved one or just yourself. You’re never too old for a rice and kidney bean panda, are you?! Happy New Year! We hope that your December and holiday season was filled with happiness, laughter, and really great vegan food. In early December, we asked for your feedback on VeganMoFo 2016 and what you’d like to see from us in the future. As a thank you, we set up a drawing for all survey respondents and we would like to congratulate Lou of Louzilla Lovegood Letters as the winner! Lou has chosen The Taco Cleanse as her prize and we’re so excited for all the taco cleansing in her future. In your survey feedback, you also told us that you’re interested in VeganMoFo being more active year-round, you like the MiniMoFo challenges, and you also want to see vegan food blogs and bloggers get more of a spotlight. Ask and you shall receive! – Monthly MiniMoFo themes: Anyone can participate, as many times as you like! 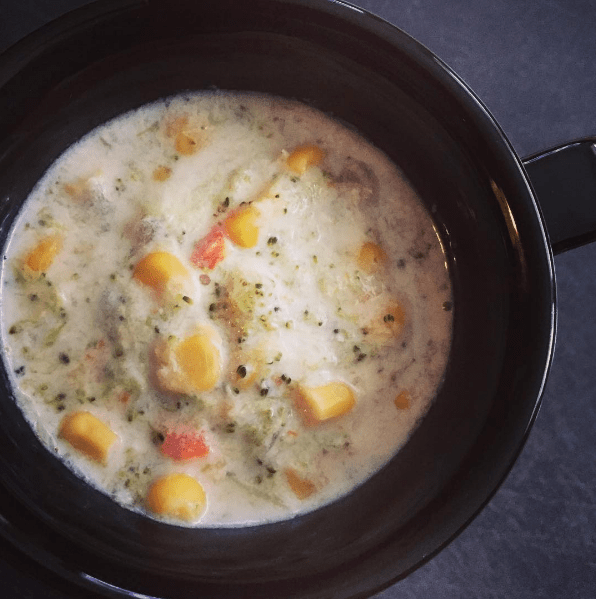 – Vegan Blogger Spotlights: Profiles and recipes from vegan bloggers, PM us if you would like to be featured! – Vegan In _____: Guest posts from vegans all over the world about the local vegan scene, restaurants, and products. – VeganMoFo 2017: The main event! This October! You told us you like the flexibility of daily prompts, weekly themes, and individual participant selected themes, and so do we! We’ll have more details as MoFo gets closer. We are always open to hearing your input and feedback, so please don’t hesitate to get in touch and let us know what you’re thinking about VeganMoFo and how we can keep growing and connecting the vegan community through fun and really delicious vegan food. The MiniMoFo theme is NEW! From now until the end of the month, share new food, new cuisines, new kitchen equipment, new techniques, or wherever your creativity takes you. Use the hashtag #minimofo to share your adventures, and we’ll put together a round-up post at the end of the month. Stay tuned for more on this month’s blogger spotlights and Vegan In posts, too! We’re so excited to share another year of vegan food and friendship with you. 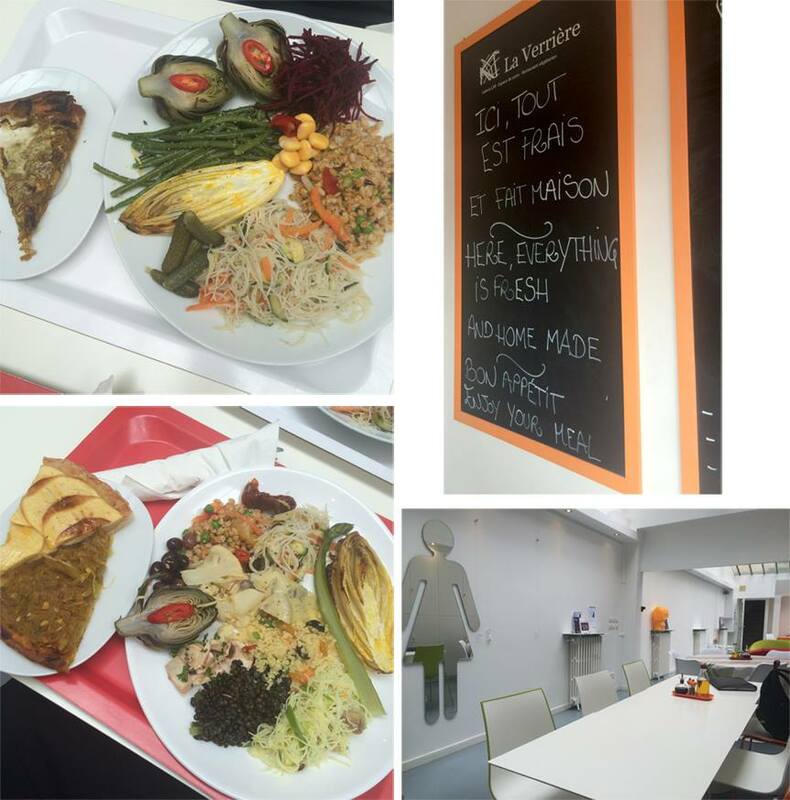 We hope you’ve enjoyed a well-earned break after November’s non-stop vegan food extravaganza! Before you get too relaxed though, we’re putting you back to work with another MiniMoFo theme. Thank you to those of you who have already completed our Vegan MoFo 2016 survey. If you haven’t filled it in yet, please take a few minutes now – your feedback is really valuable to us, and you’ll be in with a chance of winning a cookbook too. The initial feedback suggests that most of you would like to see a bit more from us, so we’re going to make some announcements in January about our plans for the future. In the meantime, we’re setting you another MiniMoFo challenge! We share a challenge, you have two weeks to make and share a dish using the #MiniMoFo tag on Instagram, Twitter, Facebook, or comment here with a link to your blog. That’s it! We’ll feature your dishes as we go and do a round-up at the end of each challenge. You can participate in MiniMoFo even if you didn’t take part in VeganMoFo in November. Have you got a special hot cocoa recipe up your sleeve? 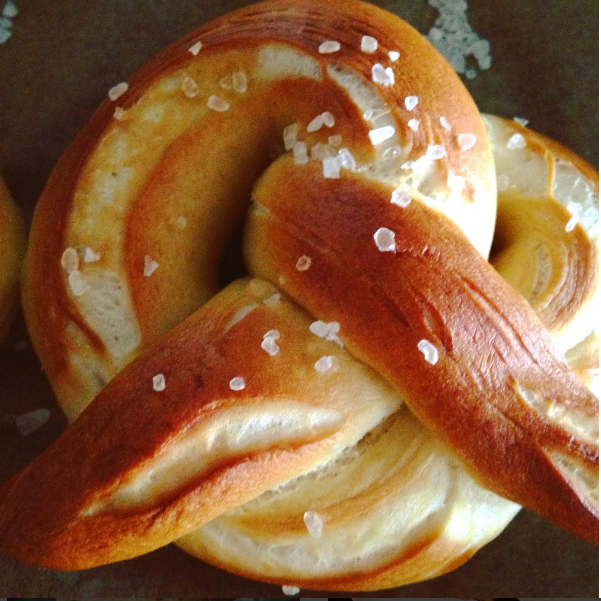 Do you cook or bake anything with a hot cocoa twist? To our Southern hemisphere friends, can you treat us to an iced chocolate instead? Get creative and show us what you’ve come up with! However you participate, remember to help us to find your blog or social media posts by using the hashtag and sharing your links with us. Check back in for a roundup post after 23rd! Thank you all for participating, commenting, liking, and sharing posts this past November! We love seeing your creativity and we’re so glad to see the vegan community grow stronger as well as larger. We want to keep growing and improving VeganMoFo, too – and we need your input to do it! Please take a few moments to fill out this 10 question survey and let us know what you think about things we’re doing well, things we could do better, and new features you’d like to see added. You can also place your vote for which month VeganMoFo 2017 should be! We’d like feedback from anyone and everyone! If you didn’t participate in VeganMoFo but follow us on social media, if you officially or unofficially participated, or something else. It’s all good! We are interested in any and all ideas and perspectives. As a thank you, we will randomly select one respondent to win a cookbook of your choice. This prize is open internationally. If you are under 18, we’ll need your parents permission to mail you the prize. You can choose any in-print vegan cookbook, not just the ones pictured here. The survey is open from now until 6pm EST on Sunday, December 18th. A winner, as well as the month for VeganMoFo 2017, will be announced on January, 1st 2017. Thank you again for making VeganMoFo such a special and awesome part of the vegan community! Week three was all about ROYGBIV, and boy did you get creative! If you’re going to go monochrome, purple is a lovely way to do it! And this all green sandwich has such a serene (and most certainly beautiful) quality, doesn’t it? I will go to any cookout where there are rainbow veggie kebabs. Invite me, I will show up. Let’s make this happen. Pizza is always an excellent opportunity to get in all the colors you can! It may not have ALL the colors, but I love the care and style in presentation of this delicious Broccoli “Cheddar” Soup! There is so much going on here! The beautiful contrast of red on green – and there must be a lot of interesting flavor and textural contrast too. The orange and green in this looks so bright and inviting. And this vegan vegetable scampi sounds absolutely delicious! These homemade vegan gumdrops look like such a special treat. And those colors! Maybe we’d all be happier if we had cheery yellow dinners like this more often! Lauren didn’t identify any of the colors here as rare, but savory waffles certainly are… by the looks of this they shouldn’t be. Who cares what color it is, these mushroom and caramelized onion burgers look ah-MAZE-ing! How amazing do these black and white aquafaba meringues look!? I am blown away! Danielle has done an excellent job of highlighting the universal appeal that is a vegan donut. We would be remiss not to enjoy some lovely, and naturally B&W sushi! I love the commitment to goth in these tamales: black beans, blue cornmeal, and blueberry mole. This purple and blue curry is seriously moody and darkly beautiful. I feel like there is something inherently goth about coffee, and these Coffee Chip Cookies fill the depths of my dark, cold, soul with a tiny flame of happiness. Or something. Whatever. Green + smoothie bowl? It was meant to be. Em does an amazing job with this one! Raw Chocolate Mint Ice Cream Cake? Uh, YES. Now we’re getting all ready for the holidays in Week 4! Food memories and traditions are on deck!